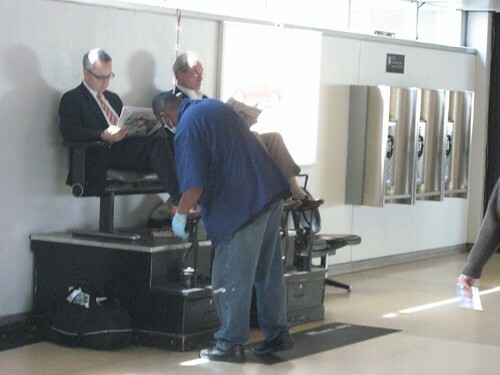 I have seen these shoe shine folks in many airports and in other busy places multitude of times.. but never once did I use their service.. but I used to always wonder.. what makes them tick in this fast world.. and does anyone shell out money to shine their shoes this way in public? But then people do.. they do shell out few bucks for it. 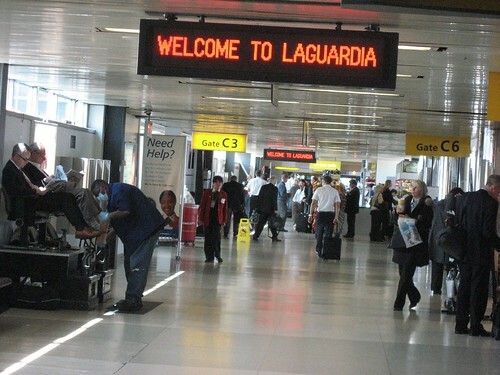 I did it at LGA (LaGuardia Airport) yesterday. As I tentatively walked near the shoe shine area, the burly looking shoe shiner (let's call him Joe) asked in a hoarse voice if I wanted to get my shoes polished.. I said yes. Joe then 'ordered' me to climb up the pedestal and sit in the Maharaja chair and wait for my turn. I did as 'ordered' with part amusement and part confusion..
As I sat there waiting for my turn, I realized that it is not just about mere shoe shine. Joe offers an opportunity to talk gossip, weather, sports, politics and everything in between. And he does so very quickly and in an entertaining fashion. But, Joe doesn't waste time though, he keeps this hands and customers moving quickly. He spends roughly 5 minutes per customer and charges a minimum of USD 5 per shine. After some wait, I got my சின்ன சின்ன ஆசை... fulfilled costing USD 8 and walked away quietly. I think this pedestal / Maharaja chair, chit chat, tabloid and shoe shine combination is uniquely American.. What say you?